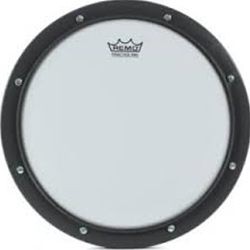 The Remo Silentstroke Practice Pad is an ideal low-volume practice solution for drummers seeking to keep their chops up. The Silentstroke Practice Pad is fitted with a Silentstroke drumhead, which gives you an 80% reduction in volume while retaining realistic response and playing feel. The pad can be mounted on a stand for upright playing, and its protective, grippy rubber bottom is perfect for tabletop use.